What are immunoglobulin superfamily cell adhesion molecules? Members of the Immunoglobulin superfamily include vascular and neural cell adhesions molecules (VCAM and NCAM), intercellular adhesion molecules (ICAM) and the Nectins and nectin-like (Necl) proteins. Nectins in particular are involved in the formation of cadherin-based cell-cell junctions , mediating initial cell-cell contacts via nectin-nectin or nectin-Necl binding and establishing links to the actin cytoskeleton via nectin-afadin binding . Of the four major groups of CAMs, IgCAMs are the only group that function independently of calcium. Members of the Ig superfamily resemble each other in their three-dimensional structure as well as their amino acid sequence (reviewed in ). ICAMs and NCAMs form heterophilic and homophilic interactions (respectively) with adhesion molecules on other cells through a rigid extracytoplasmic rod domain that contains at least one flexible hinge domain . Although nectins and Necls form both heterophilic and homophilic interactions (reviewed in ), their homophilic interactions tend to be stronger . Most ICAMs are expressed mainly by immune cells and endothelial cells, however brain-specific forms also exist (e.g. ICAM-5 aka TLCN) . All ICAMs appear to share lymphocyte function-associated antigen-1 (LFA-1, CD11a/CD18, αLβ2 integrin) as their counter receptor . LFA-1 integrin is found on the surface of leukocytes where it modulates adhesion-dependent events that are essential for immune system activities. 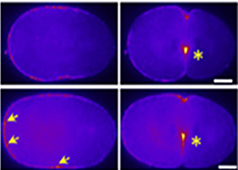 In the brain, LFA-1 expression appears to be restricted to resident macrophages (microglia) and its expression is tied to microglia activation . 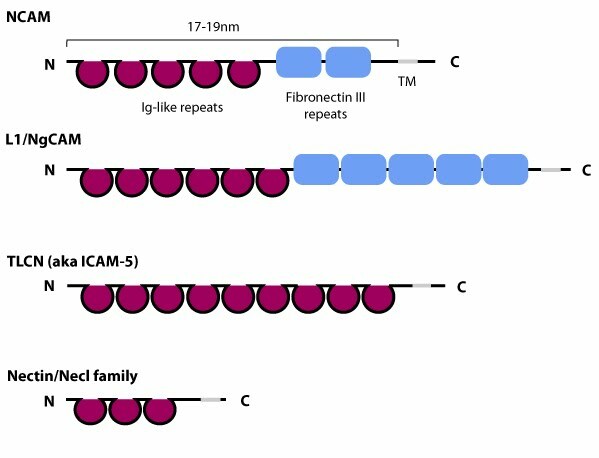 ICAM-1 and LFA-1 binding is magnesium-dependent  and the sites for LFA-1 binding lie in the first two amino-terminal Ig domains of ICAM-1; the residues involved in binding to LFA-1 are conserved in other ICAMs . Nectins and nectin-like molecules (Necls) are expressed in a number of cell types where they have been shown to be important for cell-cell adhesion and the formation of stable junctions (e.g adherens junctions). Nectins and Necls also play a role in various cellular activities including cell polarization, migration, growth and cell fate (reviewed in ). Nectin and Necls interact with and share a number of binding partners through their cytoplasmic domain, however, only nectins bind to afadin, an F-actin binding protein.